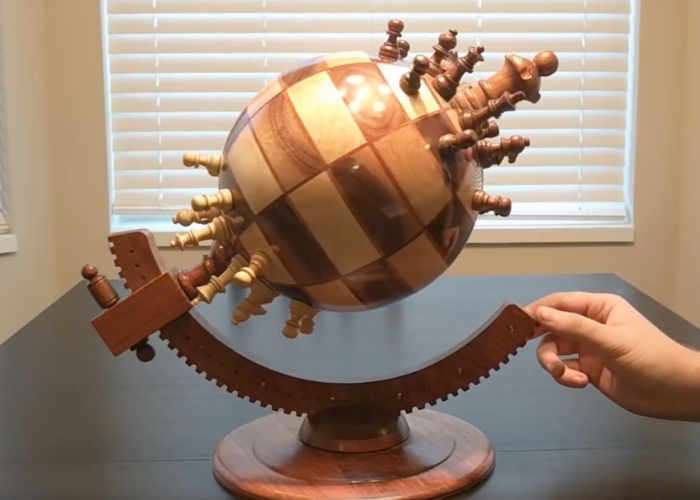 Chess players and enthusiasts looking for a unique chessboard may be interested in this DIY globe chessboard which is being created by Ben Meyers and his father. Watch the demonstration video below to learn more about its construction and gameplay. Unfortunately, at the current time, this is a one-off project which you will have to recreate yourself using some serious woodworking skills. This is a chess board that I made with my father. It is made out of Walnut, Soft Maple and Jatoba wood. It took several weeks to create and is 100% playable! Each ‘square’ has a magnet embedded in it, as does each chess piece for easy movement of the pieces.